American Colonial Currency is one of Privateer Media's most detailed areas of expertise. 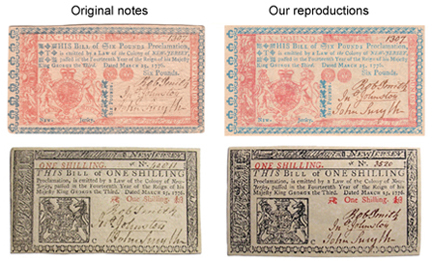 During the past several years we've developed over sixty reproduction early American Colonial notes that boast an unrivaled level of accuracy and detail. When we produce one of our notes, it's printed to look new like the day it came off the press. Privateer Media prints, packages and distributes colonial paper currency for sale in gift shops and museum stores nationwide. Take a look and you'll see our notes are the most accurate reproductions available on the market today. Our currency is printed in full color and marked with the word "COPY" to comply with Federal Law, and all of our printed work is CPSIA compliant. Retailers and wholesalers are encouraged to contact us to request a sample and to discuss how they can add our currency to their product line. Email us or give us a call M-F from 9:00am to 5:00pm EST at (610) 972 9981.